Scene It tests not just what you remember, but what you've "scene"! Using your DVD player and your remote control, select the question category and then watch a randomly selected scene from a Hollywood movie. You'll see real movie clips with all those unforgettable moments, great lines, and great laughs! Now you rely on memory, word play, observation and puzzle solving to answer a question before time elapses. Then it's a race around the game board. 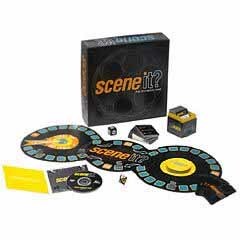 There's plenty of playing-field levelers so you or your team don't have to be movie buffs to enjoy this great party game. Bring back some memories while you're creating new ones! Game includes DVD with easy-to-understand video instructions, video timer and hundreds of memorable scenes. Also includes convertible game board for short and long games, Buzz cards, Scene It cards, numbered die, category die, written instructions, and cast metal playing pieces. Can be played as a solitaire game or in as many as four teams. The RDG Team hasn't gotten around to writing a review for Scene It?. YET. We're writing up new reviews all the time. (And adding new games to review!) And this one is on the To Do List. But we could really use your help! If you'd like to say a word or two about Scene It?, click here and we'll put it online! We're looking for more reviews and strategies for this DVD game. Submit yours here!